We are now 1 day away from significant games of baseball. In honor of the proximity of happiness upon us all, we're featuring one of my favorite baseball caps of all time. As you may have assumed, the team were taking a closer look at today is the Inland Empire 66ers. The team is named after the famous route 66, which runs from Chicago to Los Angeles and was considered the "main street of America" at one point in time. Prior to it's current existence as the 66ers, the club has had multiple prior "personalities" if you will. The team has been known as the Cardinals, Sun Sox, Giants, Suns, Spurs, Spirit, and Stampede, and 66ers in the franchises 70 year history. As expected, there have been multiple affiliations with the name changes. The big brother clubs throughout the decades have been the Giants, Dodgers, Mariners, Cardinals, and now the Los Angeles Angels of Anaheim. The team plays in the South Division of the California League in class-A advanced baseball. The club which has claimed 5 league titles, the last of which was during the 2006 campaign, plays their home games at Arrowhead Credit Union Park; a 5,000 seat stadium built in 2003, located in downtown San Bernardino, California. Among the franchises alumni, are Adrian Beltre, Mike Hampton, Felix Hernandez, Paul Konerko, and of course the great Ken Griffey Jr. Hopefully with the new affiliation with the Angels, the club will find traction, and not burnout another season. Just like the afore mentioned route 66, this club has a long trip ahead of them, until they reach the finish line. The cap shown, features a silver brim, a royal blue crown, and the team crest resembling the iconic route 66 signs which we've all seen. 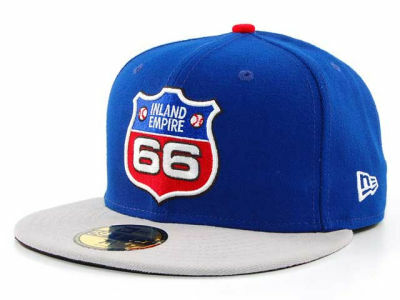 Find the cap at lids, by following this link: http://www.lids.com/MiLB/Inland-Empire-66ers/20185465 Enjoy, and I'll see you guys tomorrow. One of my favorite caps so far. Like the logo. I wonder what the uniform looks like.